I can understand why, it looks delicious! 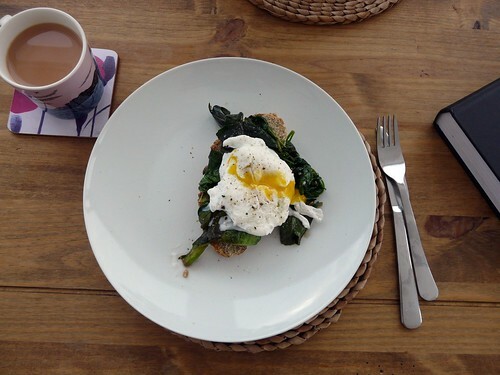 You just can’t beat a well poached egg, can you? It is snowing on your blog…very cute! Fabulous. There’s little savoury in the kitchen that can’t be improved with poached egg on top! Lovely pictures – looks like you’ve had a little bit of daylight amid all the snow? So….. how did you get the odor of vinegar to POP! I looked at the picture and I swear I can smell Balsamic vinegar. I believe that I do need to go into my kitchen and maker me some of this……*RIGHT NOW!! Thank you from a Finn in Washington State USA. Oh Wendy, this is just my kind of food. Love greens with a bit of garlic, olive oil and vinegar. I’m in an omelette phase at the moment, because I’ve *just* learnt how to make them perfectly and I’m so excited about my new skill. But now I’m hankering for a poached egg and some greens. 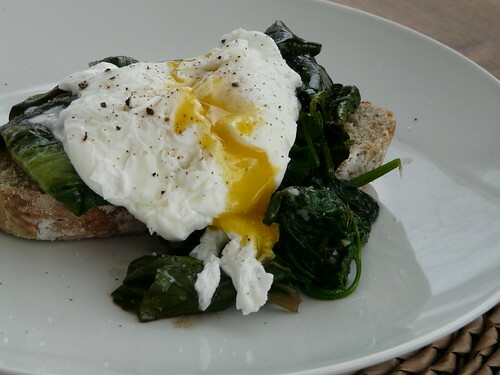 That’s the kind of thing I can eat incessantly, too 😉 Poached eggs and great winter greens are always a winner in this household. Yummy tummy food, especially in this weather! Hmmm. Looks like dinner for me! Had some kale to use up, & this was a great way to do that & have a healthy lunch. Thanks! i like the snow falling down over the blog ~ how did you do that? Oooh, now that looks divine. And your snow photos… just beautiful. I just noticed the snow!!! How DID you do that??? I love these kinds of breakfasts! So hearty and delicious!